Names, birth dates, Social Security numbers, member identification numbers, and bank account information. Email addresses, first and last names, and phone numbers. Photos, names, passwords, IP addresses, download history, and children’s gender and birth dates. Full names, encoded by decipherable birth dates, email addresses, and encrypted passwords, along with password reset questions and answers. Social Security numbers, security clearance information, fingerprints, and personal details that could leave federal personnel vulnerable to blackmail. Online transcripts and significant personal information was accessed as a result of access to previously stolen identity information. Wrapping up the year; on December 20th, 191 million registered U.S. voter records were exposed online. The database that was discovered contained more than the voter’s name, date of birth, gender, and address; which on their own is a good amount of personally identifiable information (PII). It also include the voter’s ethnicity, party affiliation, e-mail address, phone number, state voter ID, and whether he/she is on the “Do Not Call” list. As we head into 2016, we will be focused on prevention and how we can best provide information and solutions to protect your sensitive & valuable data. Many businesses migrating to VMware environments are storing or processing credit card numbers, financial information, health care data, and other personally identifiable information (PII) in a virtual, shared environment. How does an organization meet industry data security requirements and prevent unwanted access to sensitive data? Every data security project should start by making an inventory of sensitive data in your IT environment. If you do not know where to start, first consider the compliance regulations you fall under. For example, do you process credit cards? If so, you must locate and encrypt primary account numbers (PAN), expiration date, cardholder name, and service codes where they are processed, transmitted, or stored in order to meet PCI compliance. If your company is a financial institution, include Non-Public Information (NPI) about consumers, and if you are in the medical segment, you must also locate all Protected Health Information (PHI) for patients. Finally, locate all data that is considered Personally Identifiable Information (PII) which is any information that can uniquely identify an individual (social security number, phone number, email address, etc.). Business plans, computer source code, and other digital assets should make the list, too. Once you have a list of the kinds of information that you should protect, find and document the places this information is stored. This will include databases in your virtual machines, unstructured data in content management systems, log files, and everywhere else sensitive data comes to rest or can be found in the clear. After you have a full inventory of your sensitive data, prioritize your plan of attack to secure that information with encryption and protect your encryption keys with a key management solution. The most sensitive information, such as credit card numbers, medical or financial data, is more valuable to cyber criminals and should be encrypted first. Creating this map of where your sensitive data resides and prioritizing which data to encrypt is not only a requirement for many compliance regulations, but will help to focus your resources as well. Define sensitive data for your organization. Using manual and automated procedures, make an inventory of all of the places you process and store sensitive data. Create a prioritized plan on how you will encrypt the sensitive information affected by compliance regulations. While encryption is critical to protecting data, it is only half of the equation. Your key management solution will determine how effective your data security strategy ultimately is. When encrypting information in your applications and databases, it is crucial to protect encryption keys from loss. Storing encryption keys with the data they protect, or using non-standard methods of key storage, will not protect you in the event of a data breach. Your VMware key management solution should be based on FIPS 140-2 compliant key management software (find out if your key management vendor offers FIPS 140-2 compliant key management on the NIST website look it up on the NIST web site. A key management solution should also conform to the industry standard Key Management Interoperability Protocol (KMIP) as published by OASIS. Ask for the KMIP Interoperability Report from the KMIP testing process. Encrypting sensitive data on your virtual machine protects your data at the source, and is the only way to definitively prevent unwanted access to sensitive data. With VMware environments, businesses that need to protect sensitive data can use encryption and encryption key management to secure data, comply with industry security standards, protect against data loss, and help prevent data breaches. Use industry standard encryption algorithms such as AES to protect your sensitive data. Avoid non-standard encryption methods. Your encryption solution should support installation in any application workgroup that you define for your trusted applications. Be sure your encryption vendor explains any limitations in the VMware deployment. Your encryption key management solution should support deployment in a separate VMware security workgroup. Ideally, the key management solution will include internal firewall support to complement the VMware virtual firewall implementation. Your key management solution is a critical part of your VMware security implementation. It should support active collection and monitoring of audit logs and operating system logs. These logs should integrate with your log collection and SIEM active monitoring systems. As your IT environment evolves, make sure your key management evolves with you. In addition to support for VMware, be sure your key management solution is available as a hardware security module (HSM), as a Cloud HSM subscription, and as a native cloud application on major cloud service provider platforms such as Amazon Web Services and Microsoft Azure. Even if you do not have these non-VMware platforms today, it is important to consider that the evolution of your IT infrastructure is inevitable. The encryption and key management solutions you deploy today in your VMware data center should be prepared to move to cloud or hosted platforms quickly and seamlessly. A merger, acquisition, rapid growth, competitive challenges, and technology advances can force the need to migrate your solutions to new platforms. Web site and application data security can be greatly enhanced by encrypting sensitive data. An encryption strategy is only as good as the protection of the encryption keys. Poor protection for encryption keys will lead to compliance audit failures, regulatory failures, and brand damage due to poor security practices. The separation of encryption keys from the data they protect is a core security best practice. Cybercriminals may steal sensitive data, but if that data is encrypted and the keys are not readily available, the data remains protected. The separation of keys from the data they protect is also fundamental to implementation of Separation of Duties and Dual Control. Townsend Security's Alliance Key Manager provides the mechanism by which keys are separated from the data they protect. For critical systems, security is always improved by dividing responsibility among multiple administrators. In data protection, this concept means that people who have access to the data (users, DBAs, etc.) should not be the people who have access to the encryption keys. And the reverse is true. In order to achieve Separation of Duties you must separate the system, network, and database functions from the encryption key management functions. This is a core concept in PCI-DSS, HIPAA, GLBA/FFIEC, and other regulations. Alliance Key Manager provides for Separation of Duties by allowing different people to manage the web application data and the management of the encryption keys. All critical business operations that can impact the health and existence of an organization should be managed with Dual Control. Dual Control means that it takes two individuals to perform the critical operation. Because encryption keys are the crucial secret that must be protected, Dual Control means that at least two people must authenticate to create and manage encryption keys. Alliance Key Manager implements Dual Control in the security console to meet this security best practice and regulatory requirement. Security best practices require that as few people have access to encryption keys as possible to minimize the risk of loss. Be managing encryption keys in a key manager designed for this purpose, keys can be used by the applications that need them, but managed by a small number of security administrators. Alliance Key Manager allows you to grant access to only those security administrators who have the need to manage the encryption keys. Encryption keys and the Encryption Services available with Alliance Key Manager are always accessed via encrypted TLS connections. Secure connections help prevent capture of encryption keys across public and private networks, memory scraping routines, etc. Unencrypted access to Alliance Key Manager is not allowed. Unlike normal web servers which provide access to anyone with a certificate signed by a public certificate authority, Alliance Key Manager creates its own private CA unique to you, creates client-side certificates and private keys signed by that CA, and restricts access to only those clients who present a known certificate. This prevents outsiders from accessing the key server using publicly available certificates and keys. Because certificates and private keys are used as credentials for access to Alliance Key Manager, they must be protected in the Web application server. Credentials should be stored outside of the web root directory and access permission should only be granted to the web application user. For a Drupal installation, the same precautions should be taken. Active monitoring is a core security requirement and applies to all encryption key management activity. Alliance Key Manager provides real-time audit and system logging off all key retrieval, encryption services, and key management tasks. This helps meet regulatory requirements and security best practices for all key management activity. Many companies, however, do not know how they are being attacked. Today we want to expose and explore the ways bad actors gain access to, and exploit, your sensitive data. Follow along as we look at the costs, the causes, and the preventative measures of data breaches. You can click on the info graphic to download additional resources! Don't forget to click on the info graphic to request additional data security resources! In our last blog we touched on a few of the questions asked at events we attended in November. There were so many great conversations that I’ve decided to share a few more! With the various platforms that I can deploy an encryption key manager in, how do I know which one is right for me? Tell me more about all these different options you have for the Alliance Key Management Solution… are they all going to help me meet compliance requirements? There are still our original hardware security modules (HSMs) and now there are new options for deployment of cloud-based HSMs, virtual appliances (VMware), and true cloud instances of encryption and key management in AWS and Microsoft Azure. In the Cloud - If you're running on Microsoft Windows Azure, vCloud, or in Amazon Web Services (AWS),the encryption key manager can run as a true cloud instance in a standard cloud or deploy in a virtual private cloud for added data protection for sensitive applications. Because encryption and key management is so important, we offer all of the options listed above as NIST and FIPS 140-2 compliant solutions. How is Alliance Key Manager Priced? We have a wide set of options for our customers, and are dedicated to helping find affordable solutions. We have perpetual license or subscription options for classic HSMs, Cloud HSM, and virtualized environments. Our cloud offerings are true usage-based subscriptions, so if you're used to deploying in Amazon Web Services or Windows Azure, our encryption & key management solutions will fit that same strategy for pricing. We really believe that the encryption should go everywhere you need it to go! Your key management should work across a wide set of application environments, and it must be affordable, so that we can all get where we need to be in terms of protecting sensitive data. Regardless of where your data is or what platform you are using, there's a key management solution that can work for you! How can Encryption and Key Management improve my bottom line? Overall, data encryption offers many benefits and provides solid protection against potential threats or theft. In addition to the many benefits, encryption is also efficient, easy to use, and affordable! 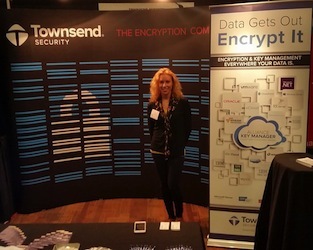 What sets Townsend Security apart from other key management vendors? We know that IT resources are limited and have done a huge amount of work to make our solutions easy with out-of-the-box integrations, simplified deployments, and also provide along with our solution ready-made client-side applications, encryption libraries, source code samples, as well as SDKs for developers who need them to get their projects done very quickly. It’s not just “Target”… everyone has a bullseye painted on their information! 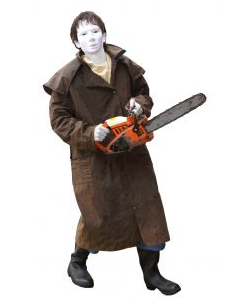 Forget about vampires, werewolves, and other things that go bump in the night. If you want to be truly frightened this Halloween, just take a look at some of the 395 data breaches reported in the first half of 2014 alone. The breach is thought to have affected the majority of the 145 million members when a database containing customer names, encrypted passwords, email addresses, physical address, phone numbers, and dates of birth was compromised. In a large nationwide malware attack, 56 million card records were stolen through point-of-sale systems. In a second attack in Atlanta, 20,000 employees personal information was stolen and used to open fraudulent credit cards by 3 human resource employees. The point-of-sale (POS) systems at 54 stores were attacked using malware and up to 3 million payment card numbers and expiration dates were obtained. 4.6 million accounts were hacked and millions of images stolen. The information (phone numbers and user names) database posted online at Reddit and another site that has now been taken down. 1.1 million payment cards were compromised over a period of 8 months as hackers repeatedly breached the point-of-sale systems through a central processing server. 774,723 customers - The insurance provider confirmed the theft of a file server and two laptops that held personal information was by a former financial adviser. Those are some pretty significant numbers, and most likely everyone that reads this blog has been affected in some way by at least one of these events. What we all need to remember is that cyber crime isn’t limited to “Black Hat” hackers that only go after the big piles of data. Sometimes it is a disgruntled employee that destroys or releases sensitive data. Sometimes it is an unintentional employee error, or loss of an employee’s laptop/thumbdrive that thieves go after. Often it is the smaller company or mid-sized Enterprise that hasn’t yet implemented security steps, like encryption and authentication, to protect their sensitive information. If the first list didn’t give you a fright, here is another that might make you tremble with fear. However, we would prefer if it resulted in the topic of data security brought up at your next security and risk management meeting! 43,600 current and former employees in 20 states, had their payroll files breached when the vendor’s system was hacked. 74,000 people lost unencrypted personal information to a former employee from Atlanta who stole 55 laptops. Company policy requires laptops to be encrypted, but they weren’t. A server holding names, addresses, dates of birth, and Social Security numbers of approximately 1.3 million people was hacked. Affecting as many as 550,000 customers across 34 stores, hackers got away with customer names, debit/credit card details (including expiration dates and security codes), account information from paper checks, and even driver’s license numbers. Also in Texas, a server was attacked that held approximately 405,000 former and current patients, employees, and beneficiaries information. This data included names, Social Security numbers, dates of birth, medical information, addresses, and some bank account information. A new study from researchers at Gartner indicates that it is markedly less expensive for companies to invest in new security and encryption technologies than it is for them to respond to a data breach. According to the analyst firm, businesses pay roughly $6 per year per user for encryption tools, or $16 per user per year for intrusion prevention software licenses, versus paying out an average of $90 per user to address problems after a breach has occurred. To help open up the conversation around your conference table, download this eBook “Turning a Blind Eye to Data Security” and find out more about the tools & resources to begin discussions about data security in your company! It seems like everyday there is a new data breach in the news. From malicious hackers to unintentional employee mistakes, loss of sensitive data is skyrocketing. Risk management has brought the data breach issue out of the IT department, and into the offices of Enterprise executives. Data loss is considered such a critical issue that encryption and encryption key management is mandated not only by many industry compliance regulations, but also by most state and governmental laws. 1 If we have a breach, we’ll just pay the fine. In many cases there will be fines for a data breach, but it is only a small part of the total cost. The cost of a breach also typically includes a forensics investigation, credit monitoring for customers, lost sales due to brand damage, and litigation costs. 2 We’ve never had a problem, so things are probably OK. This type of thinking is not a form of risk assessment. Since data breaches often take months to discover, you may not know that a breach has already occurred. Wishful thinking won’t help you prevent a breach. 3 My software vendors and consultants say they have everything under control. Today, many software vendors have not moved quickly enough to add encryption to their core products. It is not wise to rely on vague statements about data security from vendors and consultants. Make sure their solutions have been through a NIST FIPS 140-2 validation, using best practices, and based on industry standards such as AES. 4 My IT staff says we’ve done everything we can. IT departments may not have the resources or management directives they need to accurately assess and address data security issues. Meeting management’s goals and objectives within a set of operational and budgetary constraints is not the same as meeting security best practices. 5 We are encrypting our data, we are doing everything we should. If you are encrypting your sensitive data, you’ve already made a good step forward. Do you know how and where your encryption keys are stored? Making sure your keys are not stored with your data is only the first step. Good key management practices will truly protect your data. Discuss the importance of data security as it relates to risk management with all members of the organization’s leadership team. Data security is an ongoing process that involves every member of the organization, and will extend beyond your organization’s boundaries to vendors and service providers. Responsibility for data security belongs to everyone. If you have not had an external audit and assessment of your organization’s data security practices by a qualified security professional, now is the time to start. First, perform a data security assessment with an in-house consultant, security audit firm, or platform vendor to evaluate your current security posture. Find the location of all sensitive data. Lastly, evaluate the security of your backup tapes. The right security assessor will help you identify the most urgent problems, and help you prioritize your efforts. When you have located sensitive data that is not encrypted, start a project to encrypt it now. Don’t forget to invest in the necessary encryption key management devices to protect the encryption keys. 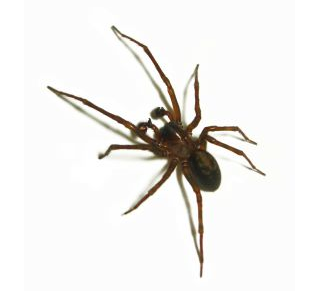 If your risk assessment warrants, provide budgetary exceptions to address the problem. Invest where you need to, as soon as you can. When choosing an encryption and key management solution make sure it uses industry standard NIST compliant encryption and FIPS 140-2 compliant key management. Every organization relies on off-the-shelf software solutions to manage and run their business operations. If your core applications do not provide encryption and key management to protect data, put your vendors on notice that they must address this issue immediately, and ask for updates. All new technology acquisitions should incorporate data security requirements into the RFP process. Performing one security assessment or passing one compliance audit will not provide the focus and attention needed to protect you from a data breach over time. You must conduct routine vulnerability scans, create new processes, and review points within the organization to ensure that you continue to monitor your security stance. Use good procedural controls to minimize the chances of fraud. Implement Dual Control and Separation of Duties to achieve a defensible data security stance. Is there more to encryption key management than just storing my encryption keys? There is far more to encryption key management than just storing the encryption key somewhere… as it turns out, there is a whole encryption key lifecycle that is (or should be) handled by a certified encryption key management solution. Generally, a key storage device only provides storage of the encryption key, and you need to create the key elsewhere. Also, just storing your encryption keys “somewhere” doesn’t work very well for compliance regulations. With an encryption key manager, there is a whole set of management capabilities and a suite of functions that provide dual control, create separation of duties, implement two factor authentication, generate system logs, and perform audit activities, along with managing the key life cycle (including storage). There is a very real need, and very specific guidelines that require you to store and manage your encryption keys away from the data that they protect. First, the encryption key is created and stored on the key management server (which can be a hardware security module (HSM), virtual environment (VMware) or a true cloud instance). The key can be created by a sole administrator or through dual control by two administrators. The key manager produces the AES key through the use of a cryptographically secure random bit generator and stores the key, along with all it’s attributes, into the key storage database (which is also encrypted). The attributes stored with the key include its name, activation date, size, instance, the ability for the key to be deleted, as well as its rollover, mirroring, and key access attributes. The key can be activated upon its creation or set to be activated automatically or manually at a later time. The key manager should also be able to create keys of three different sizes: 128, 192, or 256-bit. The encryption key manager should also track current and past instances, or versions, of the encryption key. You can also choose whether or not the key can be deleted, mirrored to a failover unit, and by which users or groups it can be accessed. Your key manager should allow the administrator to change many of the key’s attributes at any time. The key manager should allow an activated key to be retrieved by authorized systems and users for encryption or decryption processes. It should also seamlessly manage current and past instances of the encryption key. For example, if a key is rolled every year and the version is updated, then the key manager should retain previous versions of the key but dispense only the current instance for encryption processes. Previous versions can still be retrieved in order to decrypt data encrypted with such versions of the key. The key manager should use transport layer security (TLS) connections to securely deliver the encryption key to the system and user requesting it, which prevents the key from being compromised. The encryption key manager will also expire the key either through a previously established schedule or manually by an administrator. An administrator should be able to use the key manager to revoke or deactivate a key so that it is no longer used for encryption requests. In certain cases the key can continue to be used to decrypt data previously encrypted with it, like old backups, but even that can be restricted. A revoked key can, if needed, be reactivated by an administrator, although this would be more an exception to the rule than common practice. If a key is no longer in use or if it has somehow been compromised, an administrator can choose to delete the key entirely from the key storage database of the encryption key manager. The key manager will remove it and all its instances, or just certain instances, completely and make the recovery of that key impossible (other than through a restore from a backup image). This should be available as an option if sensitive data is compromised in its encrypted state. If the key is deleted, the compromised data will be completely secure since it would be impossible to recreate the encryption key for that data. 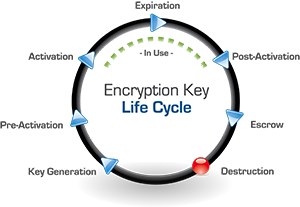 This encryption key life cycle, which is defined by the National Institute of Standards and Technology (NIST), also requires that a crypto period be defined for each key. A crypto period is the length of time that a key should be used and is determined by a number of factors based on how much data is being protected and how sensitive that data is. While NIST has defined and provided some parameters on how to establish crypto periods (see special publications 800-57 - there are 3 parts) and provided guidance on best practices. Each key management administrator needs to determine how long a particular encryption key should be actively used before it is rotated or retired. You can see that there is a significant difference between a key storage device and an encryption key management solution. Remember to always look for NIST validated and FIPS 140-2 compliant solutions to meet compliance requirements and follow security best practices! To learn more about encryption key management download our ebook on Encryption Key Management Simplified.